Here's the possible cover design for Operation Funnybone, the huge upcoming benefit anthology book for the Peter MacCallum Cancer Centre. It looks like we reached the 100 artist target! There's Moth & Tanuki on the cover! This is a really exciting, inclusive project. All going well, I'll be proofreading a lot of it over the weekend. In case anyone's wondering, I'm skipping Illustration Friday this week - this is not a picture by me! As the theme is "Wisdom," I started thinking about Anthony Phillip's album, Wise After the Event (the cover at left). It brought back to mind a cover concept I had a long time ago - a gravestone with "I knew this would happen" written on it. That's probably what I would've drawn but I've been busy. If you haven't read my blog before and really want a picture for "Wisdom," you could just check out Aging, as that also kind of covers it :). It's looking like things are bleak for OzTAKU too - as international distribution through Diamond looks like it won't be happening. I'm not sure if this means its demise at this stage, but hopefully not. It does mean more of my work on the "unpublished" heap, at least for the time being. Whatever happens, I plan to try to keep Moth & Tanuki going in some form. While nothing much appears to be happening on the Australian comics front in general, there are a number of graphic novel solo artist works in progress. Interestingly, two of these that are coming up soon - Golgotha by Jules Faber and Withheld by Bobby (Bluetoaster) Nenadovic - are set in prisons of one form or another. Maybe Australian comics are slow this year because everyone is working on a long masterpiece! Hmmmm was wondering where your 'getting to the destination' wisdom illustration went ... Cheruboy wants an owl :) Will wait for either masterpiece. We like the Operation Funnybone cover! i will look forward to your next entry, anyway, enjoy your busyness and keep smiling!! I'm disappointed that you don't have time to play this week...I really enjoy your work. 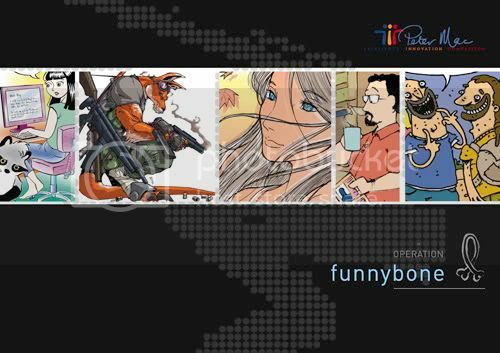 The Operation Funnybone cover looks great! "t does mean more of my work on the "unpublished" heap,"
Why don't you self publish? Or put it online? What graphic novel projects are in the works? Aren't there lots of anthologies coming out? Sorry, Anonymous Artist, I just couldn't get it together. I thought about scanning an old picture of one of the owl messengers from Maelstrom (yes, I did it two decades before that J.K. Rowling person), but I don't really like taking them out of context. "Why don't you self publish?" I pretty much hate reading online comics and I'd rather have secure Copyright wherever possible (ie: in print). "What graphic novel projects are in the works?" All kinds of things from a range of artists. I've heard of at least three more (in addition to the two mentioned) but I can't say more about them. Getting a whole book together is amazing! "Aren't there lots of anthologies coming out?" Well, lots are being compiled. Without wanting to criticise - I have pieces waiting for The Ink #3 (8 pages), Xuan Xuan #5 (14 pages), OzTAKU #4 (6 pages), the Pirates anthology (5 pages) and Tango #6 (1 page). I may have missed some. I'll have some publication news soon hopefully (but not about any of these). congrats again on that OPERATION FUNNYBONE cover spot. Sounds like you're "good busy," so we won't feel too sad that you're skipping IF this time - even though you're one of my fave artists to visit each week. The gravestone picture would've been quite witty. ::grins:: Looking forward to your next contribution. By the way, Operation Funnybone is a wonderful initiative (just read the "about us" from the site), glad to hear you're a part of it. The cover design looks great! Will the book be available internationally? I'm a big fan of comic art. "(i guess i should be reading more people's diaries)"
Oh, I don't know - going to Fiji looks like more fun :). "The gravestone picture would've been quite witty." Thanks, Angelique, I probably should have done it, but this week has been hectic and it wasn't exactly an uplifting concept. These IF themes are very esoteric. And thanks for checking out Operation Funnybone - yes, it'll be available overseas, though it will have a book-type price because it's going to be a big, big, big anthology!